Happy 4th of July!! As you read this, I’m on a flight back to the good ol’ U.S. of A. I won’t arrive back in Dallas until late tonight (first flying from Lisbon to Newark, changing planes and a quick layover in Chicago, then I’ll be home – not ideal, but it was the cheapest option)! While I’ll be missing out on the Independence Day festivities this year due to my hectic travel day, that doesn’t mean I don’t have an epic sale roundup for y’all. See below for the best of this year’s 4th of July sales! ANN TAYLOR – enjoy 40% off full-priced styles with code CELEBRATE! ANTHROPOLOGIE – take an extra 40% off sale items! Discount is applied at checkout, so no code needed. Don’t miss these, this and these. BANANA REPUBLIC – get an extra 50% off sale styles! Discount is applied at checkout, so no code needed. Don’t miss this, these and this. GAP – get 40% off everything online with code GO4th! Don’t miss this, this and this. HM – get up to 70% off + enjoy some 4th of July deals from only $4! J.CREW FACTORY – take 50% off everything! Don’t miss these (my fave style! ), this and this. LOEFFLER RANDALL – enjoy up to 60% off spring and resort styles! Don’t miss these, these and these. MATCHES FASHION – they’ve added hundreds of new styles to the designer sale (up to 60% off!)! Don’t miss these, these and this. MODA OPERANDI – enjoy an additional 20% off sale items with code FIREWORK! Don’t miss this, this and these. NET-A-PORTER – the Clearance Sale has begun! Get up to 80% off designer favorites like this, this and this. ONE KINGS LANE – save 25% sitewide!! Exclusions apply – don’t miss this side chair, this table and these gold salad servers! REBECCA TAYLOR – enjoy an additional 30% off sale with code JULY30 at checkout! Don’t miss this, this and this. TUCKERNUCK – enjoy 25% off summer must-haves with promo code USA25 at checkout! Don’t miss this, this, and these. VINCE – get an extra 25% off sale styles with code SUMMER18 at checkout! Don’t miss this perfect summer sweater. That dress is gorgeous!! Have a wonderful 4th! 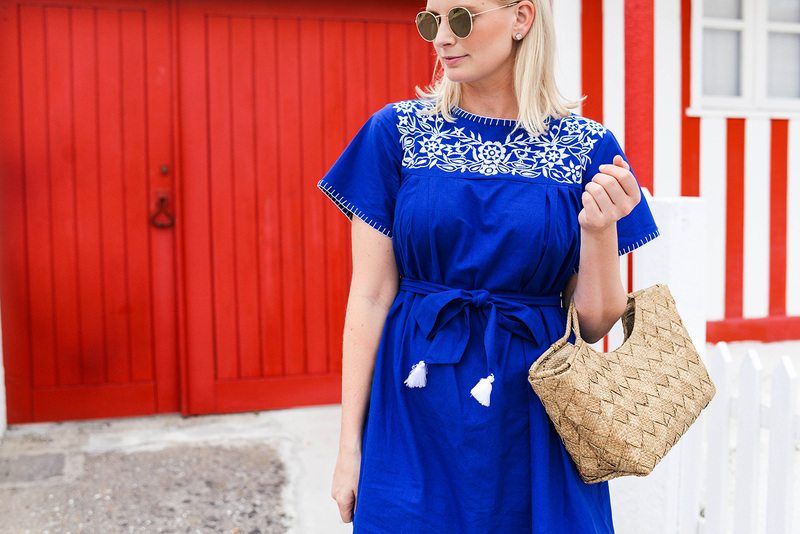 Love this blue dress, so summery chic and simple that you can wear it from work to parties. Great sunglasses and straw tote bag.